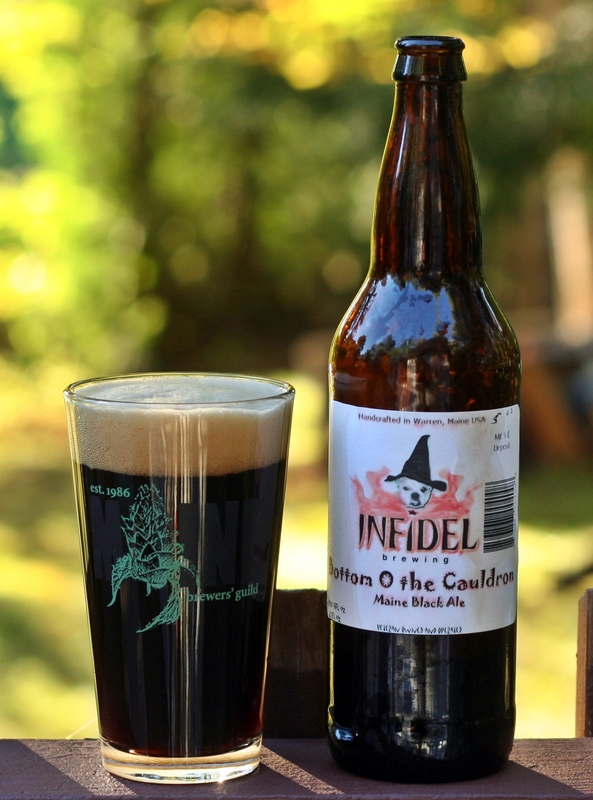 Picked this beer up at the home brew shop in Warren which is owned and operated by the same people that run Infidel Brewing. The woman there recommended the black (this beer) and the red ale which will be my next review. First I must say the presentation of this beer turned me off before even opening it. The label appears to have been printed on a home inkjet printer, not even close to professional looking. Upon opening the beer it gushed all over my counter before I could make it to the sink. I took it outside realizing that it was not going to be the best beer ever and poured almost the entire 22 ounce bottle into this 12 ounce glass to get the picture. The appearance of the beer after it is poured is the one and only good thing, a nice black color with two finger tan head. Aroma was terrible – burnt plastic is the only thing that comes to mind and the taste was worse if that is possible. I tried letting it warm hoping that it would improve and it did not. Out of the 22 ounce bottle I had maybe 2 ounces of the beer which was more than enough. From the reviews I read on Untappd and what I heard from others on Facebook I am not the only one that was disappointed in this beer. I truly hope that I got a bad bottle and this is not how the brewer intended this beer to be. Bottom O the Cauldron is about what this beer tasted like, quite possibly the worst beer I have reviewed in 2+ years of blogging.